As of this week, I've been writing about food and drink in Prague for 5 years. I've been eating and blogging pretty much non-stop since February 2, 2007. It's fair to say my knowledge of the scene is encyclopedic. And encyclopedias need updating. 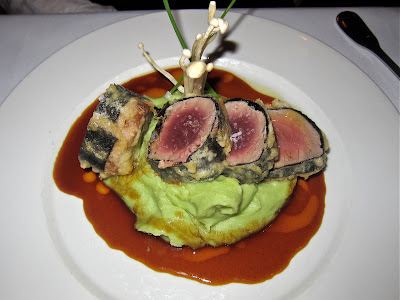 Because restaurants often change their menus, change their chefs, or even close down, many of my old posts are no longer relevant. For example, I went to Hergetova Cihelna more than four years ago. I wrote that even though the views were fantastic, I thought it was overpriced and didn't like their burger very much. A few weeks ago, a trusted source who knows his way around a kitchen told me it's now totally different. He even gave me a list of what I should order. 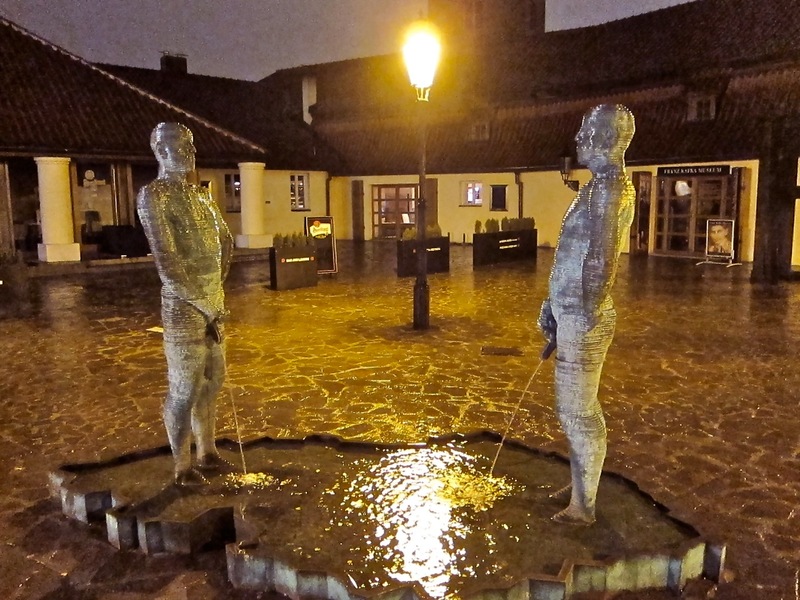 The compound housing the restaurant in Malá Strana features the humorous David Černý sculpture called "Piss." It's fairly self-explanatory, but if you haven't seen the fountain, the men swivel at the hips, and the... spouts move up and down. The water streams into a pool shaped like the Czech Republic. The compound also houses a Kafka museum. 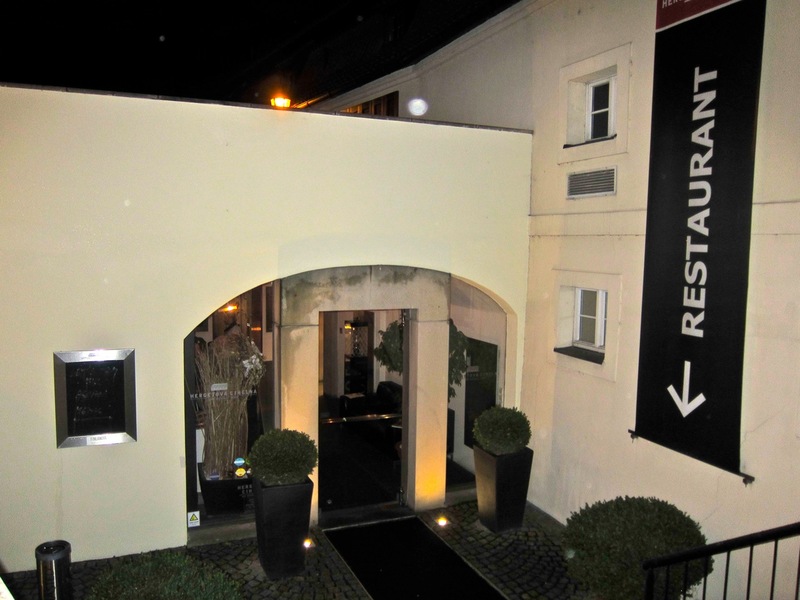 It's hard to miss the steps down into the restaurant. The entrance is well-marked. The reception is there and they take your coats in colder parts of the year. The fairly large restaurant was almost empty on the first Saturday I was there with my Italian friend. The room is broken up by many square columns that hold up the vaulted ceiling. Tables were relatively close together but smartly set. They have comfortable chairs. The bar area was also rather tight with the seating. Our friendly server showed us to our table. The music was a New Age-light techno hybrid that was not to my taste but on low volume. The Gipsy King-type music that came later was more to my liking. I had booked ahead, and we had a table by a window. 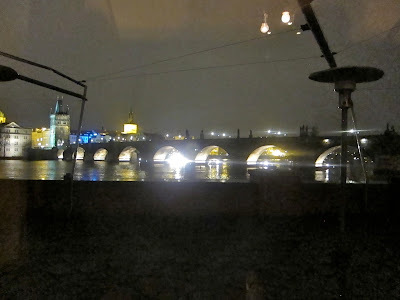 The weather was inhospitable, but we had a clear view of the Charles Bridge. In warmer months, the terrace is a much better spot to take in the scenery around the river. The waiter brought warm pizza bread rolls, served crunchy and warm, in a bowl with olive oil and garlic. Nice. We began with .15 liter glasses of wine. My friend had the Italian Cantina Tramin Pinot Grigio (145 CZK). 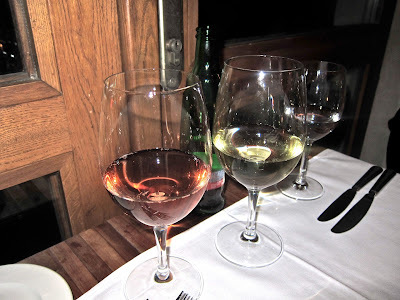 I had the French Domaine Camaisette Coteaux d'Aix-en-Provence rosé (135 CZK). Both were very light and crisp. My friend thought the white was nothing special, but I thought they were both smooth and refreshing. We had two more rosés later. 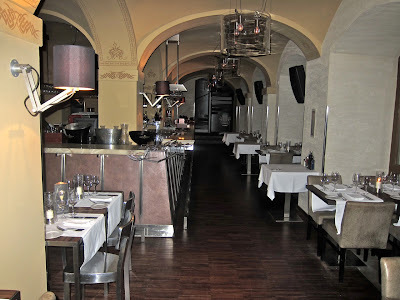 For a starter, my source highly recommended I try the improbable-sounding foie gras pizza (445 CZK). Gourmet goose liver on a pedestrian Italian crust? It struck me as a potentially unfortunate combination. But he spoke about it with such love, I had to try. The small circle of dough was only a bit bigger than my hand. It was lightly coated with a pear chutney. Slices of foie gras were baked on top of that. Then it was drizzled with aged balsamico and sprinkled with a few mache leaves. The crisp crust had a buttery top with only a little sweetness from the pear. 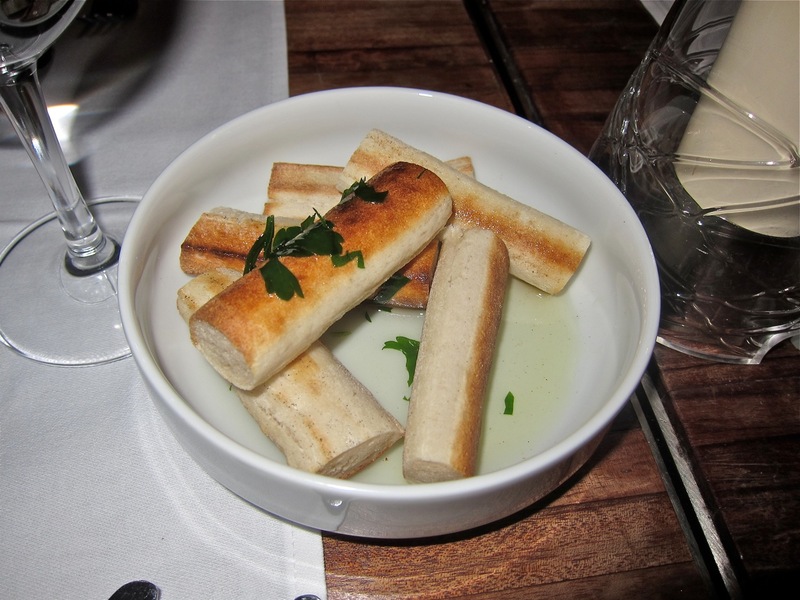 For our tastes, it was an unusual but wonderful platform for the silky, warm foie gras. The balsamico gave it the perfect tart note. Sometimes the ridiculous turns out to be sublime. We thought it was amazing. 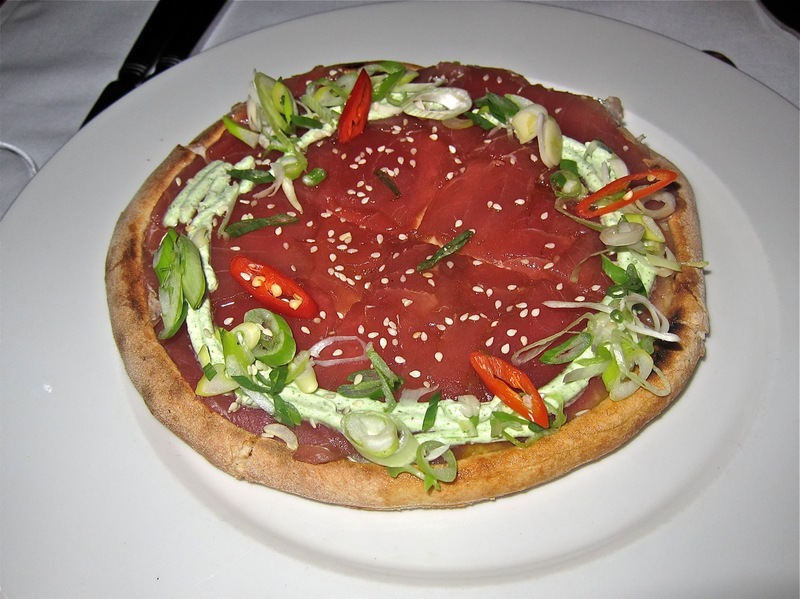 Given the uniqueness, we also had to try the sashimi pizza (395 CZK). The same crust was covered with fresh, raw tuna. The wasabi cream was very mild and had almost no sharpness to it. There were a lot of chopped scallions -- too much I'd say. We liked it, but it didn't match our love for the other pizza. Cool tuna is not as well-suited to sitting on hot bread. 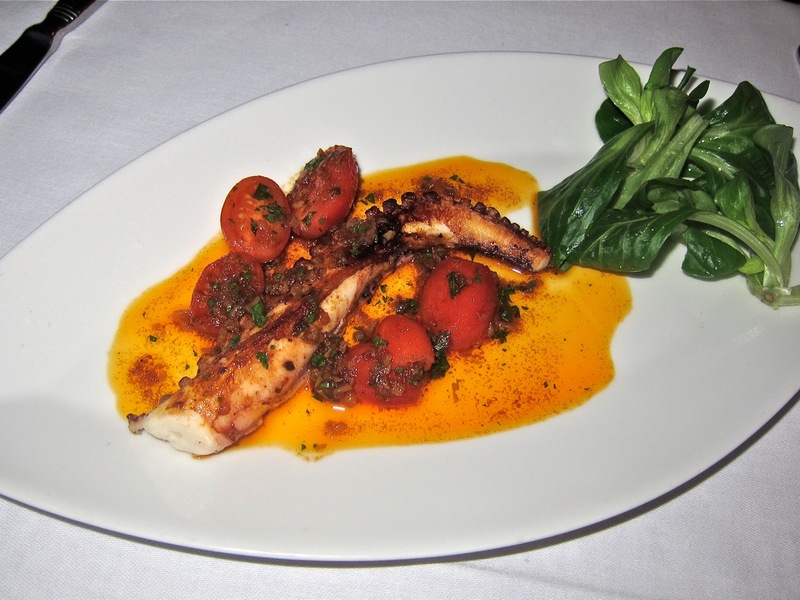 My friend decided to have a starter as a main course and got the Basque-style grilled octopus Pil Pil (365 CZK). The single tentacle was fresh and super tender. The tomatoes had good flavor, but I didn't taste much of the advertised chili. What I did taste was the garlic, which overwhelmed the dish. While I didn't mind paying a big price for the pizzas, I thought the cost of this was too high for the insubstantial portion. Next up, my source recommended I try Hergetova Cihelna's burger. I had one there years ago and didn't like it, but the man told me it was totally different. Now, if you know me, you know I take my burgers seriously. I'm quite conservative. I like them American-style, with straight ground beef and some salt with standard toppings. 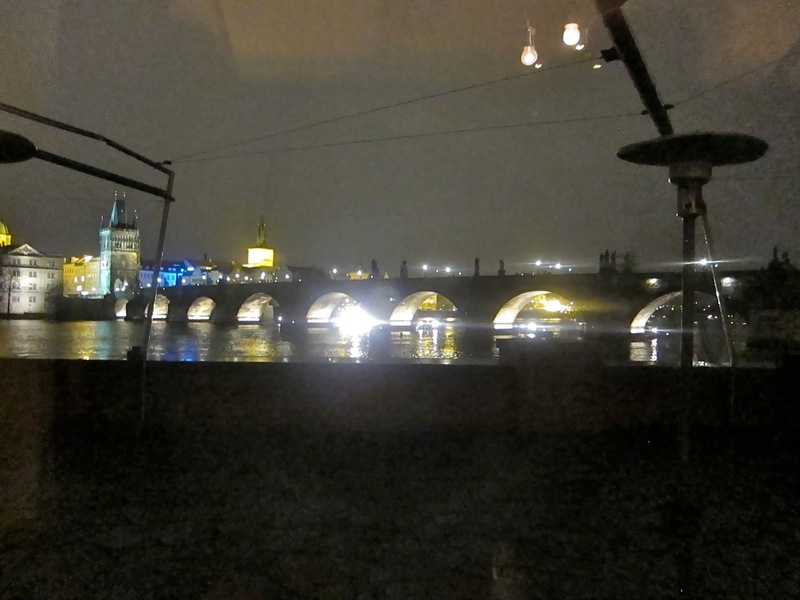 Against all my instincts, I ordered the Burger Royale (395 CZK). Served on a brioche-like custom-made bun, the ground beef is wrapped around foie gras and topped with sun-dried tomato, sweet onion compote, and rucola. The beef was the highest quality and had the most delectable smoky char around the outside. The patty was cooked medium rare. I thought I wouldn't like the goose in the middle, but the creamy center was quite enjoyable. 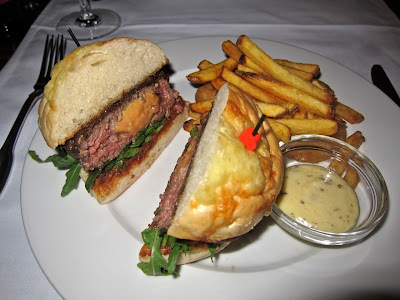 Even so, I wouldn't mind if the burger was available in a cheaper non-foie gras variation. The bun tasted great and held together like a champ, aided by being sliced in two. Even the unusual toppings worked for me. The excellent fries, with a little skin on them, were crisp and well-cooked. The two onion rings were a little greasy, but OK. The truffle mayo on the side took some getting used to. My friend, who often expresses distaste for both burgers and my obsession with them, also thought it was great. Neither of us could believe she actually liked a burger. This burger represents so much of what I've fought against throughout my adult life. And yet, I will say it is one of the finest I've had, price be damned. 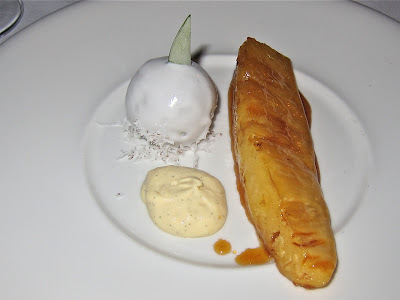 We also sampled a dessert, the baked pineapple with spiced caramel (195 CZK) from their Asian lunch menu. It came with a creamy, dreamy coconut sorbet and a dollop of what tasted like vanilla cream from a crème brûlée. The bill for this meal came to 2520 CZK before tip. That's serious money, but I enjoyed the meal so much, I thought I wouldn't mind doing it again. So we did it again a week later. This time, most of the restaurant was booked for a corporate party, so we almost didn't get a table as walk-ins. 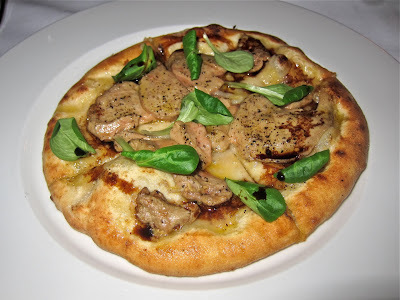 We sat at the bar and shared another foie gras pizza. Then my friend ordered something we saw go to another table on the first visit: tempura fried tuna (585 CZK). She made sure to ask that it be cooked rare. The middle slices were close to rare, but the end pieces were medium. It was served with a well-executed, light green wasabi-potato purée. Underneath was a gari-veal jus that was close in flavor to a sweet teriyaki sauce. On top, there were enoki mushrooms. My friend liked it, but our pleasure was undercut by the overcooked bits. We wanted to see more red. 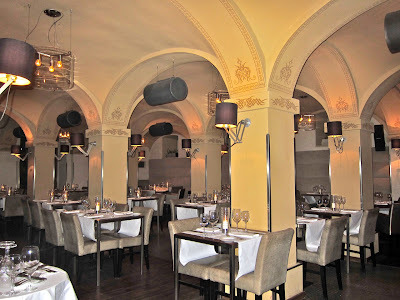 I ordered the grilled lemon sole (595 CZK). 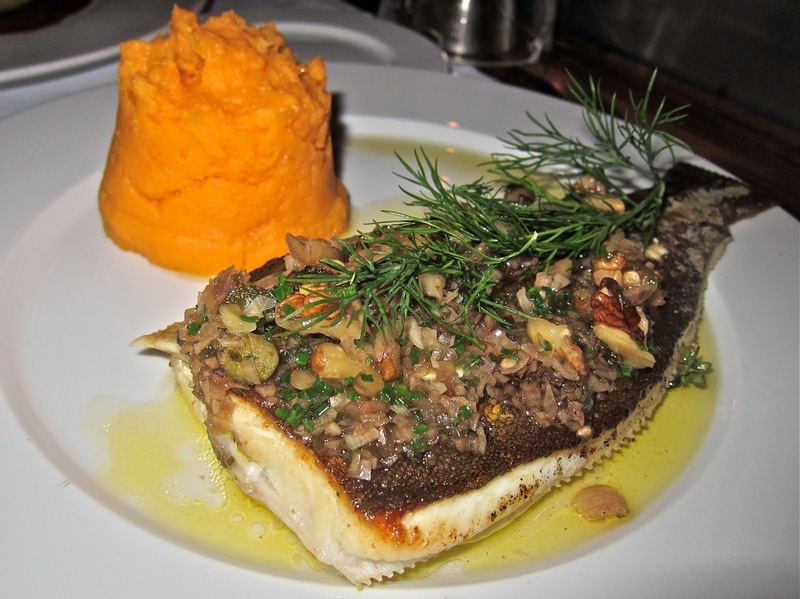 I've eaten filet of sole many times, but I'd never had the whole fish, including skin and bones. This one was topped with beurre noisette with chopped capers, nuts, chives, and shallots. The whole top filet, including the skin, was wonderfully delicious. The delicate, flaky flesh was perfectly fresh, moist, and a real pleasure. There was just a hint of lemon. After lifting out the bones, I discovered that the bottom filet didn't fare as well as the top. It was bathing in the butter and became butter-logged. Still, I'd rank the top half as best sole I've ever had. I'm a big fan of sweet potatoes and often mash my own at home. This iteration didn't thrill me. It was far too lemony, to the point of sourness. Despite the issues, I'd get the sole again. 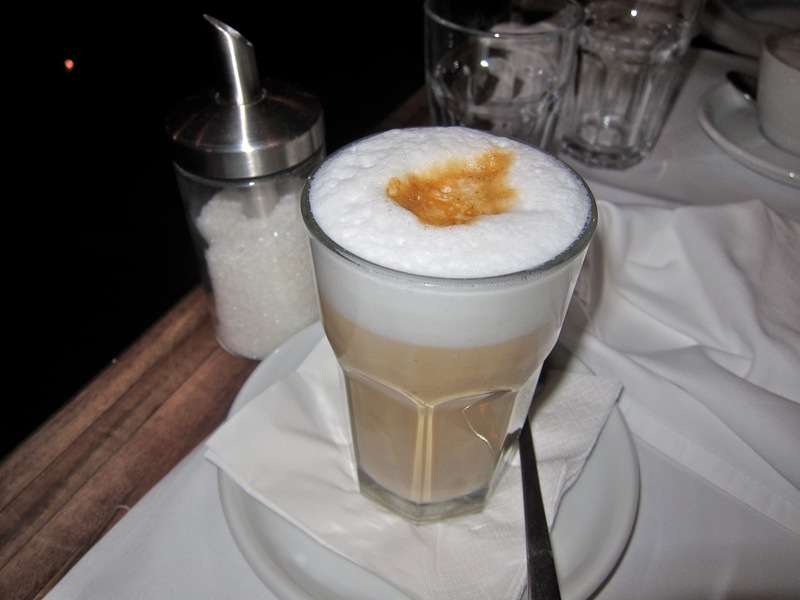 My friend finished with a cappuccino (65 CZK) and I had a cafe latte (65 CZK). Both were good, though my friend remarked that the sugar dispenser seemed out of place in a restaurant of this class and price level. This meal cost 2350 CZK before tip. Service was almost always friendly and efficient, except at the very end when the large corporate party got started and the waiters got pulled away for a while. I know there are people out there who will be aghast at the thought of foie gras on a pizza or in a burger. I used to be one of those people. But these marriages of haute and humble just worked for me. I can't deny it. I won't wait another four years to return. I'll probably be back during the warmer months on the calendar. Sitting on their terrace with the burger and a glass of wine will certainly add some much-needed sweetness to the simplicity of my life. It's hard to put a price on that.